Fleeing persecution and torture in northern Iraq, three young Kurds, Mahmoud, Rezghar and Saman, smuggle themselves into Britain aboard a freight train. Arriving in London they register for asylum but soon experience the first blast of bureaucracy, as their papers are lost in the system. 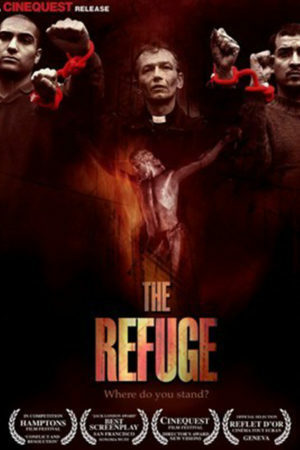 When Saman is detained in prison and the police attempt to arrest Rezghar, he flees and hides in a church where Father Michael is leading a service. So begins a lengthy standoff with the police and immigration officers as the priest offers sanctuary to both Rezghar and Mahmoud and the church becomes the focus of intense media attention. With Father Michael under siege from armed police, the Press, racist neighbors and his own superiors, tension mounts until something – or someone – threatens to break. Nigel Roffe-Barker’s poignant social drama looks beyond politics to the desperate human stories behind the newspaper headlines. Boasting heartbreaking performances from Dar, Bradley and former EastEnders star Elouahabi, Asylum expertly illustrates the timeless tug-of-war between authority and refugee. And in the light of the Government’s announced immigration crackdown, never has a film been more prescient and pertinent..